Like any fever; however, this one is also destined to break. I should know, I’m a doctor after all. 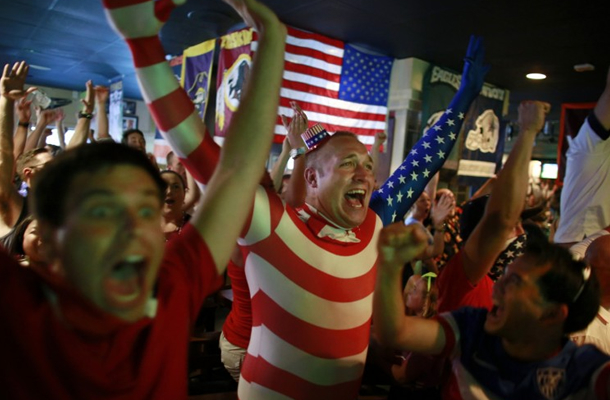 Even if America makes it to the knockout round, which looks promising, American fervor for soccer will simmer down again once the Cup is over. Why, you ask? Simply put, Americans are overly stimulated. Thanks to vices like reality TV, high-powered NFL offenses, and Tang, we lack the collective attention span for day-to-day soccer. Most people won’t stick around to watch MLS games that end in a 1-1 or worse, 0-0, tie, even if you drink copious amounts of beer like most doctors recommend. Not to take anything away from it–soccer is arguably the most physically demanding sport to play, and it requires more discipline than a monk on Bourbon Street. However, the collective population won’t fully take the time to appreciate it, at least not anytime soon. So then, why is the World Cup such a big deal? It’s because there is one fundamental trait that is ingrained in us from the moment we start school and reinforced continuously beyond the first time we hear Bon Jovi’s “Livin’ on a Prayer.” We have a strong sense of national pride, and that gets amplified when we’re on a global stage. For example, we cheer any and all American athletes during the Olympics, but when it’s over, we don’t start watching regional Curling matches and figure skating competitions. In fact, I would wager that at least 50% of the people who cram in the bar to watch the Germany game won’t be able to name more than three players on Team USA, or know what the positions are in soccer (beyond goalie). Before anyone calls me unpatriotic, for the record I’m not criticizing anyone here. In fact, I appreciate people who don’t really know or care for soccer, but take the time to cheer along with the American Outlaws while they’re trying to help our players make history in Brazil. Regardless of your own preferences when it comes to political affiliation, beer or personal grooming, we are all bonded by the fact that we’re American, and for better or worse that scrappy group now represents us to the rest of the world.